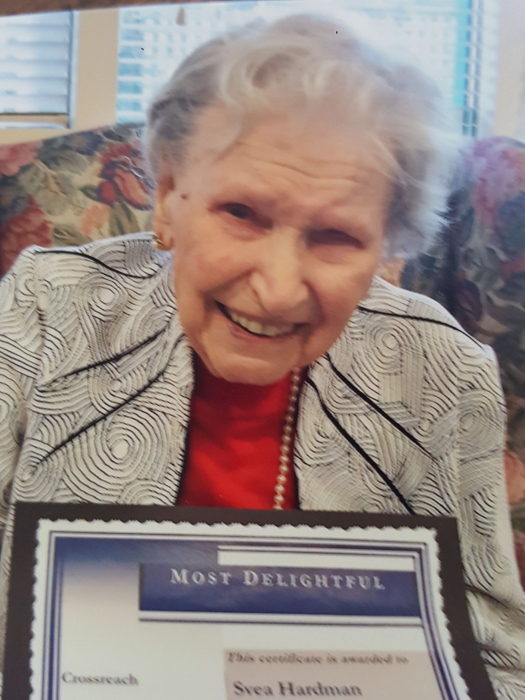 Svea passed away peacefully January 16, 2019 at the age of 97. Predeceased by husband William Hardman in 1985. She is survived by her children Richard (Julia) and daughter Norah McLeod (Bob) and grandchildren Eric, Carolyn, Mark and Sarah along with 5 great grandchildren. Svea was born in Finland and immigrated to Canada in 1926, she returned to Vancouver in 1968 after 12 years in Brockville Ontario where she was an active member of the Beta Sigma Phi and the I.O.D.E. Svea enjoyed travel throughout Scandinavia and the Baltic and short cruises around the Pacific Northwest. She belonged to a Finnish travel club and enjoyed several trips with them. A family memorial service will be held at a later date. In lieu of flowers please consider a donation to the charity of your choice.